Written on January 14, 2019 . 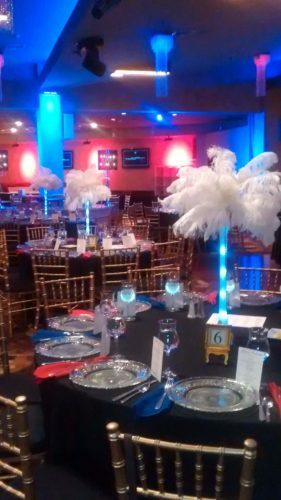 When planning your next party and want a tent rental from Pink Elephant, there are of course other rental items to consider such as tables and chairs. If you tell us the scope of your party plans we can take the pressure off by supplying most of the items you will need. But there are some things you may not have considered which will add a lot of pop to your party. Decorations — We can supply some of the table decorations, but you and family or friends can have some fun by designing your own decorations, or buying them locally if you aren’t the crafty type. Let your imagination run wild and think of things to complement your event. Lighting — Daytime parties may not need lighting, but you will want to light up your party at night. You have a lot of options when it comes to lights. If you have electricity available we can supply overhead lighting in the tent. For a softer look consider candles on the tables. If it’s the summer season you can use citronella to keep the mosquitos away. Rope lights and LED accent lighting is another option. Think about your party theme then go light it up! Music — Some music will bring your party up a notch. If a formal event, you may want to consider live musicians. If a birthday party or adult event a DJ might be the best bet. Think about the event and your guests and add some music to your event. Cocktails — From a simple beer cooler to champagne, cocktails can always get the party going. Since you are renting your table linens from us, you also don’t have to worry if someone spills a glass of red wine. For informal parties just serve drinks in plastic cups if you want. You can upscale or downscale to suit your needs. Whatever the event, large or small, Pink Elephant can help you create the perfect atmosphere with our extensive party rental equipment. From snacks and cocktails to a full dinner we have the equipment you need to make your party a perfect event. Contact Pink Elephant today at 631-357-3561 and watch the party pressure evaporate with our help! Providing the entire Suffolk County and surrounding Long Island area with the best possible party rental experience.